Editing: Reduced time available over weekend. The today – real life intruded early – personal issues to attend to – and then penetrating and worrying talk in the library interfered with concentration. In spite of all some work was managed for several chapters but will need to be revisited. It is my good luck that Denise’s book includes a fair chunk of material relevant to the timeframe and place for my character. Gives me confidence to develop fictional incidents and responses for Present tense and Future hope. Anthology: By chance members of our Writers Group have been given a wonderful opportunity to talk about our experience in developing our Ten Minute Tales Anthology as a curtain-raiser for an author talk by a well-known writer. The anthology can be found by Googling Ten Minute Tales anthology. It is free. Such fun we had getting this modest little production together and what a lot we learned along the way. 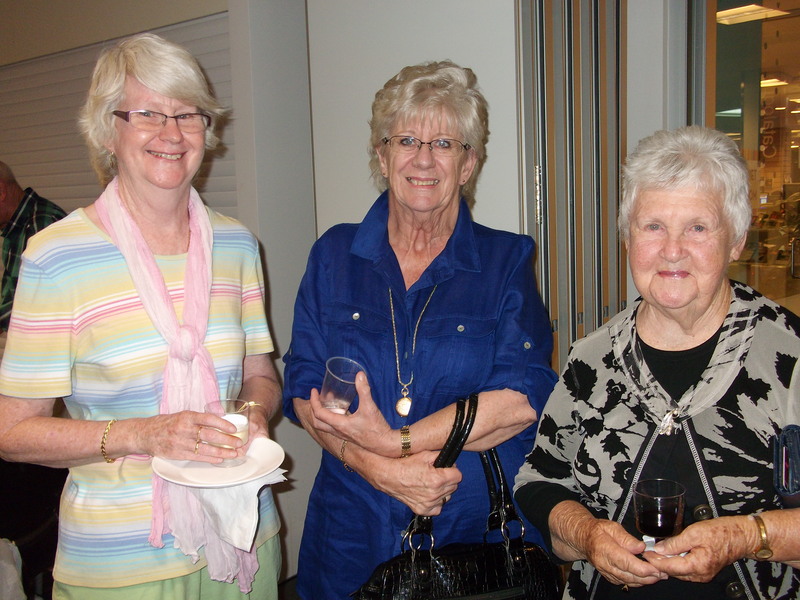 Book launch: The book launch of my author friend Pat Noad was a great success. 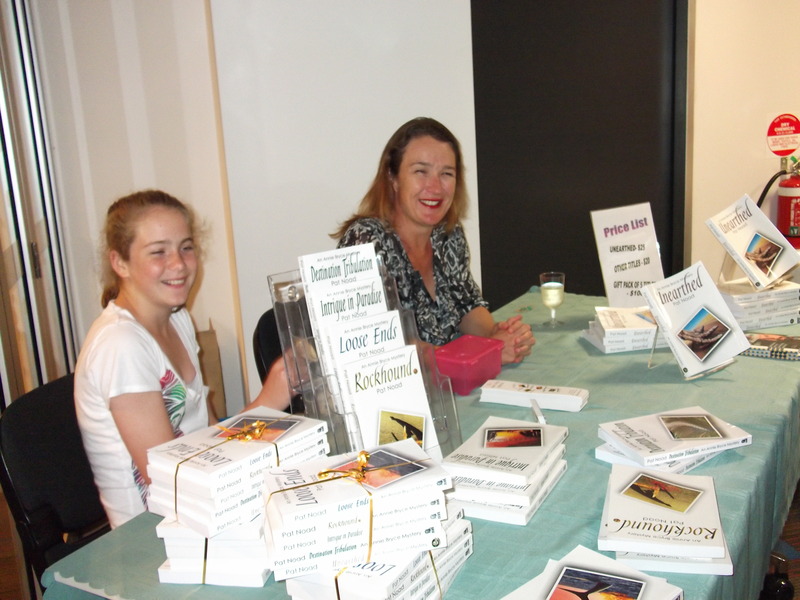 I include two photographs – one of the author herself, and one of her trusty helpers Kym and Jaymie Tilbury at the book table on the night, where all five of Pat’s Annie Bryce mysteries were available, singly or as a package. Thanks for permission to print pictures. 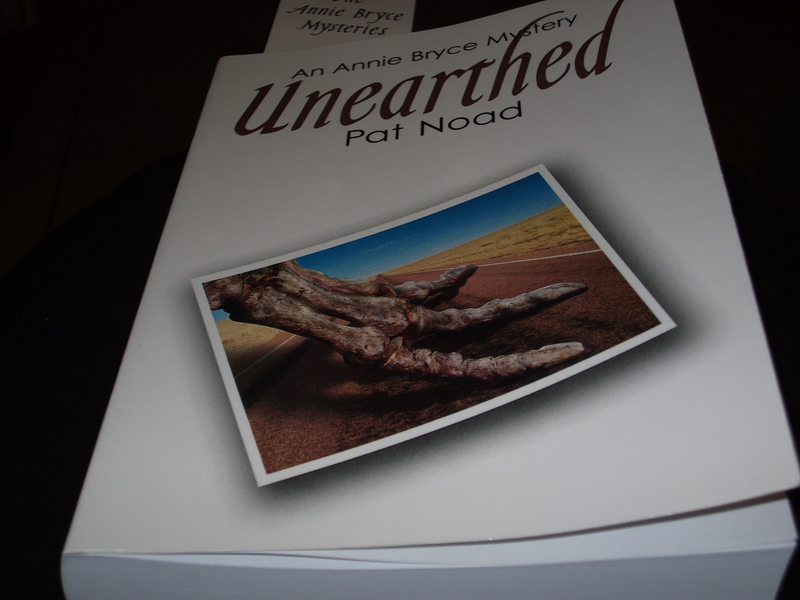 Details of Pat’s books can be found on her website at http://www.bypatnoad.com.au.Happy reading. Special thoughts: Very best wishes and loving thoughts to friends and relatives with health issues both here in Australia and in the UK. Stay strong. Be well. Reading: What remains by Denise Leith has captured me, and what is surprising is that a chunk of that story provides fodder for my minor fictional war correspondent character who reported around the action in Sarajevo and beyond. Thank you Denise – you made it terrifyingly real. Editing: Over recent days I’ve been working on two fronts – finishing those last paragraphs of Present tense and what I hope is the final sweep for Past imperfect. I’ve put Present tense aside for several weeks so that I can see it with fresh eyes. It’s been slow so far with Past imperfect. I’m one quarter throughand feeling satisfied that the changes are enlivening the narrative. Hopefully my writing was improved for the later chapters and I wonder if an end of the month target for completion is too optimistic. I’ll stay with that meantime. Writing: Writing Group members who contributed to the anthology, Ten Minute Tales, that we recently e-published for free now feel we have learned how to manage the process well enough to embark on a more serious effort at quality writing. Last week we agreed our focus – to produce a collection of short stories with a ‘twisted’ orientation. We’ve set a completion date for the end of November and a maximum 1,500 word-count. One member is off to a flying start with a story completed already. I’m struggling with the ‘twist’ emphasis and grappling to find something that works – meantime all that surfaces is as lightweight as a spiral of licorice. I guess I’m thinking maybe we need to aim for more than one story each or perhaps to find several themes or even something open, as well. Is that an escape hatch for lack of inspiration / application? Or a legitimate thought for something solid enough to publish? Reading: A few real books and several e-books on the go. Continuing with Caleb’s Crossing, the Redlitzer Anthology 2012, Where war lives: A journey into the heart of war, and another war correspondent journey, What remains by Denise Leith – a devastating story of different kinds of horror – at the moment I’m with her in Rwanda after a spell inSarajevo. These readings balance each other out in different ways and with topics in current editing where the story is personally disappointing for the protagonist but underneath is a happy situation even though that is at risk. I’m taking advantage of The Australian (newspaper) offering of free e-books for readers. The Marmalade Files by journalists Steve Lewis and Chris Uhlmann was a straight-through riveting read – brought back so many memories of eight years working in the Commonwealth bureaucracy in Canberra – thin cover for contemporary happenings in the national capital. It really is like that. Reminds me of the TV programs, Yes, Minister and Yes, Prime Minister, so popular in the UK many years ago. 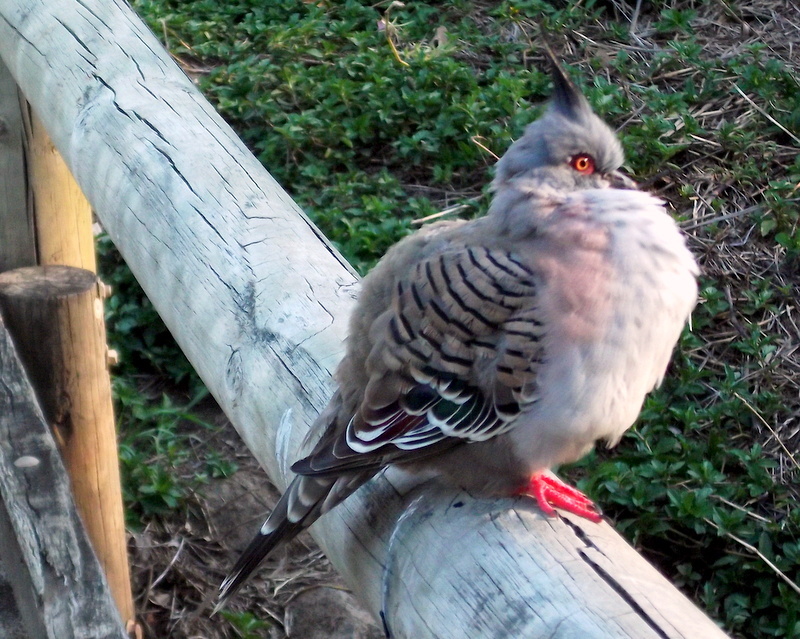 General: During a weekend walk we met this wonderful fluffy creature. About to capture a front-on shot, a cyclist hurtling over the bridge sent the bird off in fright. Another day perhaps but it will be a big bird then. The library was quiet today. Students are back at school. The sun is shining again. 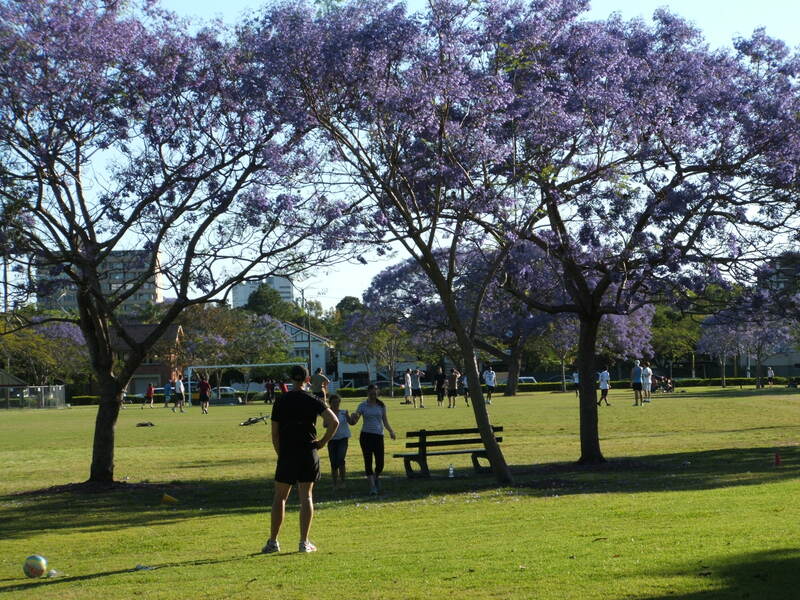 An earlier dry spell and recent winds have reduced the blossom from our beautiful jacaranda trees. We’re left with carpets of mauve. I hope there are some late bloomers left. They are among my favourite trees. Edit diary: A little bit of editing happened – way behind expectations. I hope to complete the current sweep of Present tense soon before moving to Future hope, the third in a family saga series. A number of mundane happenings (pest and termite inspection requiring furniture removal from walls, servicing of air-conditioning, appliance breakdown, business meetings etc. etc.) interrupted the edit flow and there were a few unexpected events as well. Never mind, with the walls and floors behind furniture exposed what better time to dive into spring-cleaning that somehow didn’t happen properly last year. Too busy swanning around Europe and Canada and having a great time. 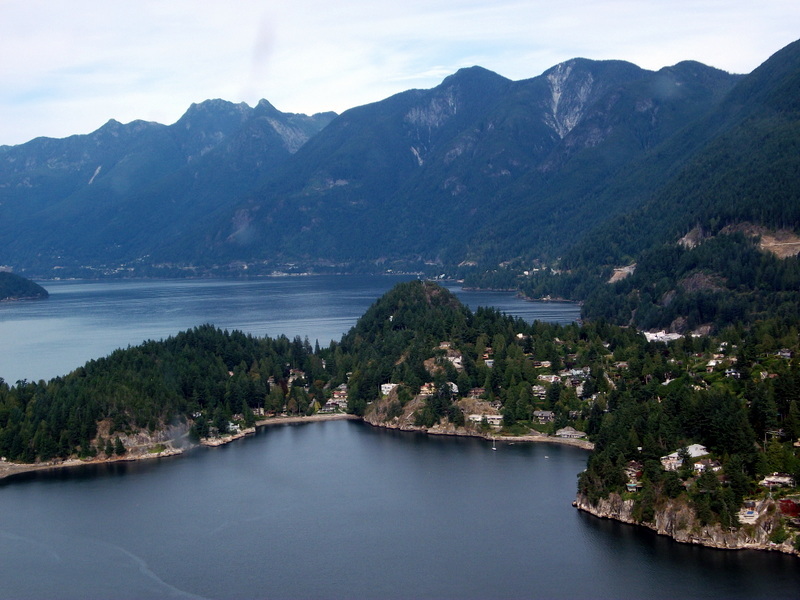 Will include one photo reminder from last year – Vancouver, one of my favourite places away from home. However a number of bus journeys to and from Brisbane last week gave the opportunity to catch up on reading. Reading: Back to a third read of Six months in Sudan: a young doctor in a war-torn village, by James Maskalyk – an incredible and saddening catalogue of civil strife and trauma, unmet basic needs and epidemics of preventable diseases and lack of infrastructure and essential resources. It wasn’t a new story then and although the north and south of Sudan have since separated, the situations continue. Wonderfully low-key writing that packs a punch. I am backing up the reading with watching the newly released MSF TV AUSTRALIA program which will run for a month. Compelling viewing. So much being done; so much still to do. If only we could change the world. Of course the questions are ‘which we’? and ‘change which way?’ Could go in an entirely unbearable direction instead of towards harmony and help and fairness. Another disturbing read was Dorothy Koomson’s tale of tragic events that affected two teenage girls and the lasting and widespread legacy that followed. The blurb says ‘Gripping, thought-provoking and heart-warming, The Ice Cream Girls will make you wonder if you can ever truly know the people you love. I stayed with the book because of the excellent writing. My current book is Caleb’s Crossing by Geraldine Brooks. The writing is superb and lives up to previous books of hers that I enjoyed – March and People of the Book. I look forward to having the companionship of the two main characters, Caleb and Bethia over following days and learning more of their lives in the 1660s between Martha’s Vineyard and Cambridge. Writers Group: A small group this month but as usual we travelled far and wide, enjoyed the company and benefited from the constructive comments and suggestions offered. Other news: Last night, two of our members – Marci and Sara, received Highly Commended certificates at the Redlitzer Short Story awards, and launch of the second annual anthology. 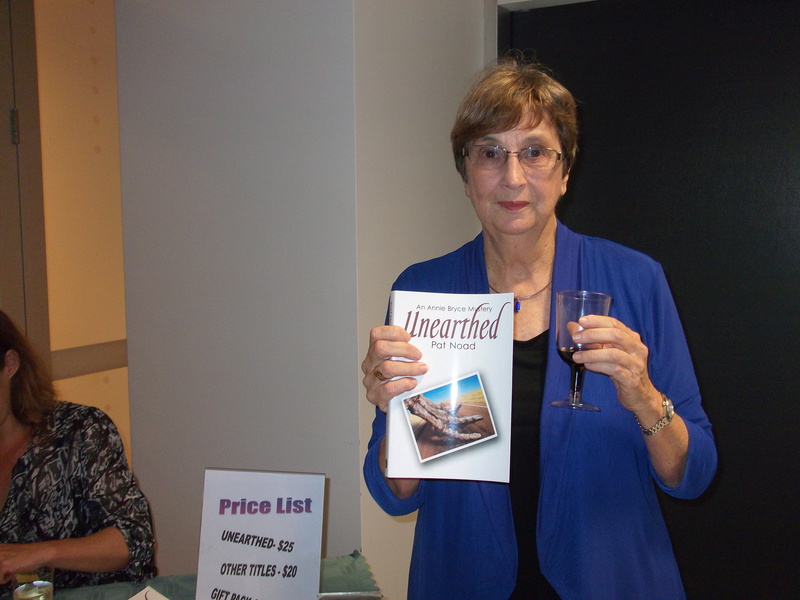 It was a very successful event in support of emerging writers in the Redlands. The anthology features ten stories from adult writers and ten from young people. Another read to be savoured. And in ten days I’ll attend the launch of a friend’s fifth book.